In late June, a warehouse at the Barton 1792 distillery in Bardstown, Kentucky collapsed, sending 9,000 barrels of bourbon crashing to the ground. The cause is still unknown. In the days that followed, the situation seemed to get worse and worse. A partial collapse became a complete collapse, and another 9,000 barrels came tumbling down. It was unclear if any of the whiskey could be saved. A bunch of fish died. There was no joy in Mudville. But today, the Lexington Herald-Leader and writer Janet Patton bring us a story of recovery, and it is just really nice. 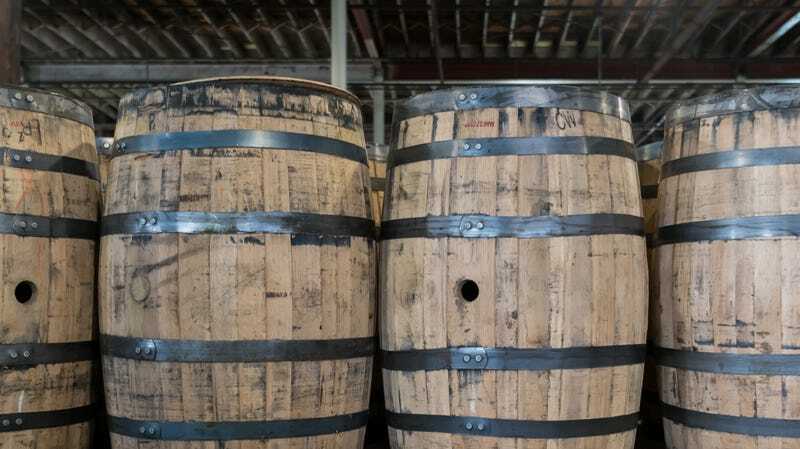 When it comes to what the distillery is dealing with, Patton paints a hell of a picture, describing a “multistory pile of broken barrels and smashed staves” through which workers must carefully pick in hopes of saving some of the barrels. And here’s how the company is confronting such an enormous task: with great care and no unnecessary haste. The recovery process began the week of July 9, and per the Herald-Leader, it’s likely to take months. The process is a simple yet delicate one: One giant crane retrieves a barrel gently from what we’ll call “sad bourbon mountain,” and places it on the ground. A second crane picks it up and moves it away from sad bourbon mountain, where it’s then snagged by a Bobcat machine, which maneuvers to an even greater distance to an awaiting inspector. The inspector, ah, inspects the barrel for damage or leaks. If a damaged barrel can be saved, it’s then moved for coopering (barrel repair). If it can’t be salvaged, the barrel is then drained into a “clean tote tank” and held for future re-barrelling. One last note: Normally, when we encounter a great read like this one, we at The Takeout encourage you to give them your clicks because it’s a great read and because this is a gross click economy now, and that all applies here. In this case, however, the story also contains a lovely video that we can’t embed, so please do go watch the thing. You won’t be sorry.